No. 285242 L./Cpl. Alfred Wilcox, Oxf. & Bucks. L.I. (Birmingham). 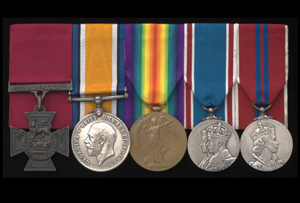 For most conspicuous bravery and initiative in attack when his company was held up by heavy and persistent machine-gun fire at close range. On his own initiative, with four men he rushed ahead to the nearest enemy gun, bombed it, killed the gunner, and put the gun out of action. Being then attacked by an enemy bombing party, Cpl. Wilcox picked up enemy bombs and led his party against the next gun, finally capturing and destroying it. Although left with only one man, he continued bombing and captured a third gun. He again bombed up the trench, captured a fourth gun, and then rejoined his platoon.